The stretch of coast from PE south through the Western Cape and home to the world famous Garden Route in South Africa has some of the most stunning coastal towns and quaint villages to be found anywhere! St Francis Bay is one such jewel - ideally located in the Kouga district of the Eastern Cape, along Route 62, between Port Elizabeth and Knysna. St Francis Bay properties offer a high standard of living and the area is favourably endowed with pristine sandy beaches, fresh air and beautiful surrounds. 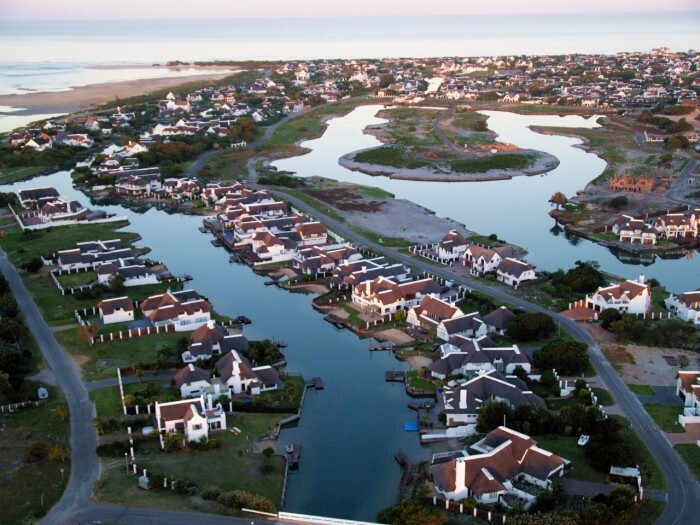 St Francis Bay is also situated along an unspoilt coastline, with its interesting river linked canal system and unmistakable natural beauty that attracts both local and foreign guests every year! Apart from surrounding nature reserves, interesting ecosystems and undeniable tranquillity, St Francis is also surrounded by unique sights such as the Baviaanskloof Mountain Range. While the small town with its unique architecture presents a ‘traditional heritage’, residents of St Francis Bay still enjoy a modern lifestyle!If you are looking to make a pure investment purchase, or for permanent residency - St Francis Bay homes will put you in close proximity to major landmarks such as the century-old lighthouse and the Rehabilitation Centre for the African Penguin, to mention just two. All educational, health, entertainment and public amenities needed to sustain a high quality of life are within reach of those visiting, living or purchasing St Francis Bay homes. This, in spite of the fact that the area still offers its characteristic “peaceful and serene” lifestyle – void of the hustle and bustle of densely populated cosmopolitan areas! Houses for sale in St Francis Bay usually don’t remain on the market for too long – they are snapped up quite quickly by families looking for a relaxed lifestyle, or investors with a keen sense of value looking for wealth creation or to enter the accommodation and ‘hospitality’ market. St Francis Bay residents can often be found enjoying the abundant wildlife as they navigate by boat up the serene river or sit back and fish off of their private piers. Social events and activities are also abundant for St Francis Bay residents as the community often hosts fun gatherings that are both family oriented and adult specific. What type of housing is on offer in St Francis Bay? St Francis properties are relatively unique with the village offering a blend of different housing styles in different sections. The permitted aesthetic styles include white homes which are painted and need to have either black or thatched roofing in the Canals area and around the golf course as well as a more Mediterranean architectural design in the Santareme and Port St Francis area. This strict styling adds to the appeal of St Francis Bay houses and gives it a distinct feel and flavour you won’t find anywhere else in South Africa. For schooling options you have St Francis College as well as several great options in nearby Humansdorp, Jeffreys Bay & Port Elizabeth, particularly for senior primary and high school learners. Some options include Woodridge College, Grey High School, Pearson High School and Alexander Road High School. Parents will be happy to know that there are also safe and convenient bus-rides and boarding facilities for those who prefer. St Francis Bay residents pride themselves on their sporting enthusiasm and are well on their way to positioning St Francis Bay as the preferred sporting destination. Some of these include 2 X 18 hole golf courses, mountain biking, trail running & walking, squash, tennis, surfing, wind & kite surfing, paddling, fishing, whale watching, dancing, yoga and many other activities. These are all focussed on safe learning and are coordinated by professionals with vast experience and knowledge. This means that almost anyone, both amateur and veteran, can learn and enjoy something new in the company of friendly folk with great social interaction! St Francis Bay is home to various independent brands catering for day to day items from clothing to various retail stores and restaurants. For leading brand and familiar names you have the Fountains Mall, less than 30 minutes away – where you will find the likes of Mr Price, Identity, Swiss Watches and many more. Seaview Centre and Wavecrest Shopping Centre are likewise situated very close to homes in St Francis Bay. If that’s not enough though, Port Elizabeth is only an hour away for St Francis Bay residents and offers a diverse shopping experience with several facilities at your disposal. This can also be a great place to spend a night out with your family or friends, or do some last minute shopping before Christmas or birthdays. port-st-francis-apartmentsMany of the houses for sale in St Francis Bay are literally on the edge of the river and canals. In fact many St Francis Bay residents also enjoy fishing from their personal pier on their properties! This truly brings the best of outdoor living right to your doorstep. Wildlife is also abundant in St Francis Bay area and over 200 different bird species from Flamingo to the Great Heron can be found migrating through and inhabiting the unique river ecosystem. In addition to nature areas, various footpaths and hiking trails, St Francis Bay real estate owners look forward to ending their day relaxing on a Sundowner canal or river cruise or taking a chartered whale watching trip out into the bay. So, if you’re looking for a fantastic place to settle down with your family and enjoy an unspoilt setting and relaxing lifestyle - with nature and the beachfront at your beck and call -then you need look no further than houses for sale in St Francis Bay. With the choice of St Francis Bay homes along the river, between the canals or in the tranquil surroundings of the bay you can be sure that you will definitely find your dream home in one of the most sought after ‘addresses’ in South Africa. Contact our local office to find out more about current listings for St Francis Bay properties, and to schedule an appointment with one of our local St Francis Bay estate agents. With Chas Everitt on your side you can be rest assured of making the most prudent investment, buy, sell or even rental decision. Call today for specialised property assistance you can depend on!